Watch as the Jewish people gather for the annual Birkat Kohanim ceremony. 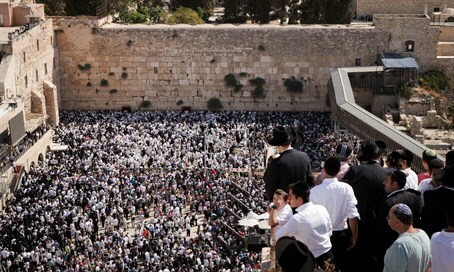 Tens of thousands of Jews visited the Western Wall (Kotel) Monday morning, for the annual and traditional Birkat Kohanim (Priestly Blessing) ceremony in honor of Chol HaMoed Pesach (Passover). Congregants then said the Shacharit morning services prayer at 8:45 a.m.; the first Blessing was at 9:30 a.m.; the Mussaf prayer was at 10:00 a.m.; and the second blessing, at 10:30 a.m. The ceremony then included welcoming words from Chief Rabbis Yitzhak Yosef and David Lau. Due to the influx, the Israel Police has boosted security throughout the Old City of Jerusalem, with heavy police presence along every entrance and exit to the Western Wall and to the Jewish Quarter. Entrance is closed to private vehicles, and police have advised motorists wishing to attend to park on Mount Scopus, at Ammunition Hill, at the Police Headquarters, and at Binyanei HaUma and then take public transport to the site.